Beat the base is a modified game of softball that builds on fielding, throwing and catching skills and encourages teamwork and thoughtful placement of the ball. It provides a good introduction to softball. Divide your players into 2 teams; 1 team fields and the other bats. 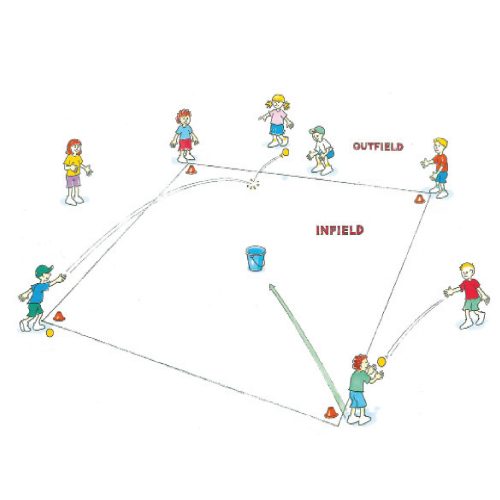 The fielding teams must start outside the baselines and are not allowed to move until the batting team has thrown 3 balls into the field of play. 1 player from the batting team throws 3 balls into the field of play then runs between markers placed on the 1st base line at 2, 4 and 6 metre intervals. Each batter continues to run, each time making a choice of what distance to run to score points until all 3 balls a fielded and thrown to a base. Each fielding player at a base must have 1 ball thrown to them, stand on the base and hold the ball in the air to stop the runner from running and scoring runs. How should we stand when waiting to catch the ball?